My flash story “Within Without” is now up at Lakeside Circus. There’s also a podcast version, read by the inestimable Don Pizarro. Various beta-readers commented on the machine-like quality of the “voice” in this story, yet Don manages to inject both a sense of gravitas and escalating urgency to his performance. I’m really pleased with it. “Within Without” features a Matrioshka Brain, a solar-system sized calculating engine, facing an existential crisis. The story arose from a prompt requiring the use of frames — a story set within a story set within a story, etc. In the end I didn’t write anything like that at all, but instead used a nested structure. And even that was drastically abbreviated. So basically I utterly failed at satisfying the prompt criteria. Still…as to the story itself, you can judge for yourself. 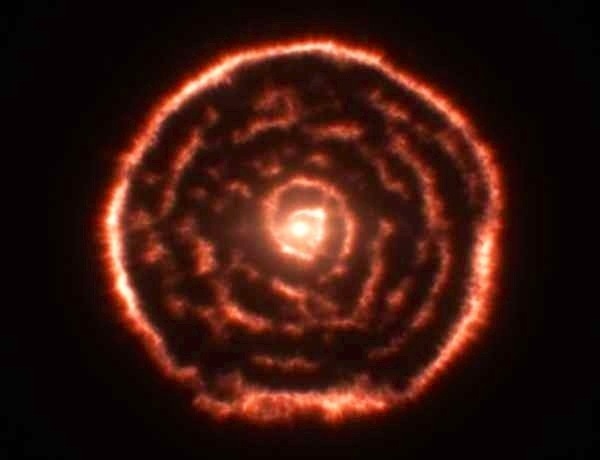 A visualization of a spiral structure in the material around the old star R Sculptoris. Not a matrioshka brain at all. No.